Short-term rental offerings in Long Beach on Airbnb, a popular STR website. Despite a ban on STR's in the city, people continue to offer their homes on the site. Airbnb and other short-term rentals in Long Beach could soon see more rules if the City Council next week chooses an option to regulate the growing industry. As short-term rentals have exploded in popularity, cities across the country have grappled with regulations while addressing local concerns over quality of life, noise, safety and enforcement. 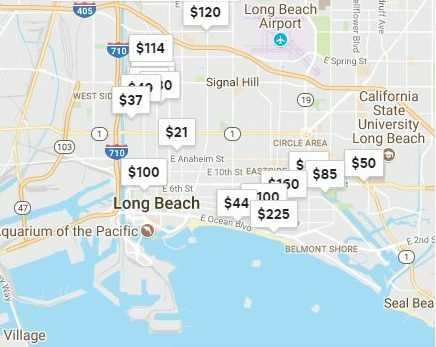 Long Beach, which has about 1,300 active short-term rentals, is considering three options for regulations that range from least to most constricting. Option 1 would include rules such as mandating registration with the city, requiring a local 24-hour contact, prohibiting short-term rentals in low-income or student-housing units and enforcing city noise ordinances. Option 2 includes additional rules such as limiting the number of short-term rentals for multi-unit buildings, prohibiting large events, limiting the number of guests and establishing quiet hours from 10 p.m. to 7 a.m.
Option 3 is the most constraining and adds a rule allowing neighbors to petition to prohibit rentals in a designated area. While all three options would add a 12 percent tax, city staff are recommending the council adopt Option 2 because “it addresses the primary concerns and quality of life issues consistently voiced by the community,” according to city reports. City officials had been counting on taxes from short-term rentals to help offset a roughly $15 million shortfall for the fiscal year. Option 2, however, would generate less revenue since it would require higher administrative and enforcement costs, according to city reports. Option 1 could generate a net revenue of up to $1.12 million, while Option 2 could generate up to $280,000. Option 3 could generate up to $155,000. The council will consider the options at its next regular meeting at 5 p.m. on Tuesday in Council Chambers, 333 W. Ocean Blvd.